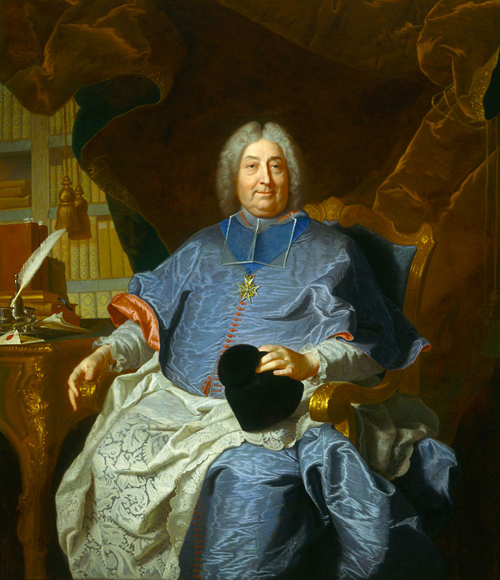 The Archbishop's portrait needed to display his wealth, status, and power, but also his humanity and piety. The rich library shelves loaded with books represent his scholarly interests as well as wealth. The silver inkwell, quill pen, and shuffle of papers, including an envelope with a broken red wax seal, refer to his reputation as a writer and administrator. A mozzetta is a short, elbow-length cape that buttons up the front. It is part of the vestments, or official garments, of an upper-level Roman Catholic official like an archbishop. The rochet (roh-SHAY) is a white, knee-length tunic, often with long sleeves and hem of lace. It is part of the vestments, or official garments, of an upper-level Roman Catholic official like an archbishop. His face is carefully and naturalistically painted so he is immediately recognizable. The elaborate medal represents L'Ordre des Chevaliers du Saint-Esprit, or the Knightly Order of the Holy Spirit. Membership in this exclusive group was by invitation of the king, and limited to royal princes and the highest nobles. The biretta is a square cap topped with a tuft or pom, worn by Roman Catholic priests. An archbishop is entitled to wear a purple biretta, but he holds a black biretta like that worn by ordinary priests. The cassock is the traditional basic garment of a Roman Catholic priest. It is ankle-length, with long sleeves, and buttons up the front. Ordinary priests usually wear a black cassock, while an archbishop could wear a cassock of purple. A two-inch wide blank brown strip at the bottom of the painting was reserved for an inscription, but it was never added. Dramatic drapery billows in the background. It is deep brown, possibly made of velvet. The large and elegantly carved and gilded armchair is upholstered in deep blue.